Today, my Dad and I drove over to Dulles and the Udvar-Hazy Center of the Smithsonian Air and Space Museum. I have never been to the Air and Space Museum on the Mall but my Dad says it is nothing compared to this museum. The Center is a very large hangar on 3 levels with an amazing arrary of airplanes, helicopters, spacecraft and aeronautical machinery, electronics and paraphenalia. It is truly amazing and if you love aviation and aerospace like I do – then this is a must see. First we came in trough the main doors after having to pay to park. There was lots of room in the morning since the kids are still in school in Virginia and Maryland. Right away my Dad went to the ticket area and bought us tickets to see the IMAX production of “Fighter Pilot:Operation Red Flag”. Since it wouldn’t start for 50 minutes we decided to see how much of the exhibits we could walk around and observe. First up was the SR-71 Blackbird sitting on the hangar floor in all its black matte glory. What a plane – my favorite, since it is used in “Transformers: Revenge of the Fallen” as the character JetFire and was filmed at the center. Then we walked straight ahead to the McDonnel Space Hangar and saw the amazing Space Shuttle “The Enterprise”. Then we went over to the area that held the space science exhibit including The Advanced Orbiting Solar Laboratory as well as The Space Lab. On the other side was Rockets and Missles including another ALCM Cruise Missle like the one we saw in Rome, NY at the Buffer display. We decided to walk around the Vietnam and Cold War exhibit next to the SR-71 display. There we saw famous and great jet fighters and bombers like the F-4S Phantom II, the A-6E Intruder and X-35B Joint Strike Fighter. There was even a F-105D Thunderchief and a Sikorsky UH-34D Seahorse Helicopter from the Marines. By this time it was movie time and we went up to the theatre. The movie was great and showed the flying skills of our great U. S. Air Force fighter pilots in both the f-16 (bad guys in Red Flag) and the F-15 Strike Eagle (the goods guys) as well as the other ally Air Forces participating including Canada with the F-18A and the Germans with their Tornados and the Brits with their Harrier Jump Jets. We had an AWAC controlling all the action, C-17’s demonstrating supply drops, tankers doing inflight refueling, B-2 and B-1 and F-117 stealth fighters demonstrating how to take out the radar and AAM defence systems. They had a flight of A-10 Thunderbolts (my dad calls them Warthogs) showing what they can do to the enemies armor as well as a “downed pilot” SAR drill using the USAF PJ’s (Pararescue Jumpers) fast-roping down from Pavehawk UH60 choppers. They are just like the Seahawk UH-60’s that fly by Hammock Dunes every day. After the movie we went to the on-site Mickey D’s and had lunch. After that we purchased simulator tickets and my Dad and I got to use a real flight simulator – I was the gunner and my Dad the pilot. We had no kills because my Dad never lined it up quick enough on the target. Next time I’ll have to fly and he’ll have to shoot. Our last visit was over to the Business Aviation and Vertical flight exhibits where we saw the Concorde, this one from Air France. It is my Mom’s favorite plane and she and my Dad once flew it round trip from London to New York but before I was born. This is Frederick and I am still buzzing from such a great v isit to a great museum of great planes. Next up, tomorrow we leave for Colonial Williamsburg. The Big Apple and Me! So far, our road trip has been lots of fun. Now we are in New York City, on Central Park South, where the carriages line up with their horses to take you on a ride in the park. Our place is right across the street. We are staying in The New York Athletic Club and they have pictures of all the Olympians that are members (or were) of the Club. Very impressive to see all these accomplished atheletes from one Club. When we drove in on Friday it was very busy, congested and slow but it even got slower on Sunday due to the Puerto Rican Day Parade down 5th Avenue. We were trying to get to St. Patrick’s Cathedral for the 1015 Choir Mass. More on that later. Friday night we met a family friend for dinner at the Yale Club. We sat outside on the 22nd floor of their building and it was neat. The food was buffet style and really good. Saturday morning we walked up Broadway and Columbus, had a nice breakfast at Epicirie Boulud where we sat outside and ate croissaint, cheese and tartines. Then we walked further up to the American Museum of Natural History, one of my favorite places in the world because it has the best dinosaurs. So does the Natural History museum in London but this one is closer. We did 3 special shows at the Museum: The Largest Dinosaurs, Sea Rex and Origins of the Stars. Later we took a taxi down to Rockefeller Plaza so we could go the Lego Store and the Nentendo Store. For dinner later in the evening we ate a small bistro on 66th St. – Chat Noir or the Black Cat. Whenever anyone in my family sees a black cat they say “Look there’s Nonkel Stanislaus” because my Mom’s great Uncle you to tell her that when he dies he wants to come back as a black cat. Sunday we woke up and had breakfast at La Pain Quotidien (The Daily Bread) which is very Belgian and has the best breads, croissants and brioche as well as good Parisian Ham and cheeses. This what we eat in Belgium for breakfast with other chacuterie. After breakfast we headed over to St. Patrick’s for mass. This was Pentecostal Sunday and it is very important in the Catholic calendar. My dad was able to get us a nice pew on the center aisle mid-way down. The organ music was beautiful as the procession started with Cardinal Dolan in his gold mitre and shepherd’s crook. He stopped and waved to people and even saluted to me. Later after the mass ended and during the recessional he saw me and came over and patted my head and asked me how I liked the mass. He gave me his blessing. My Dad said he had never seen a Cardinal say mass and now I even got extra special treatment. It was something I won’t forget. We then walked down to Park Avenue to grab a taxi to B&H on 34th and 8th where my Mom likes to go for her photography and camera supplies. We spent an hour in there and she bought a new lens for her big camera. We came back to the Club and headed out to the Landmarc in the Time Warner center. That was a good lunch. Later that evening we had dinner at the club with a friend and they had soft shell crabs which my Dad loves. So, now we are in DC and at my sister’s house in Darnestown near Potomac where they are holding the US Open of golf. More on my visit to DC and the Air & Space Museum later. This is Frederick and we are now on another leg of The Great American Road Trip. We are still catching up to the travel blogging. So here is one from Tuesday when we drove over to Howe Caverns. Since it is always 52F inside the caverns we brought sweat shirts along as well as sturdy shoes for walking inside. When we got there we had to wait 5 minutes for the next tour group to form and get a guide. Our guide was Laura and she knew a lot about the cavern. First we went inside this room where a talking mannequin of Lester Howe introduced us to how he discovered the caverns in 1842 and what to expect on our tour including a boat ride 200 feet below the surface. We took an elevator down 154 feet and the guide would walk with us and explain all about the formation of stalactites, stalagmites and flowstones. My first question was “are there any bats”? Yes, there are but you can’t see them since they get scared off by the first visitors and guides talking. We saw different formations and continued to walk on nice brick walkways with hand rails until we came to the “Chinese Pagoda” which is really a “speleotherm” of calcite. We walked down the cavern until we came to the Lake of Venus where we got on a boat which the guides used poles and their hands on the rocks to guide as down the water further (about 300 yards). We came to the end where they have a chain over the entrance to a further length of tunnel they may open up in the future. Then we turned around in our seats and went back to the place where we first got on the boats. There was an older lady, like my grandmother, who needed help getting off the boat and she asked me to hold her purse while the guides helped her out. We walked back to where we began but went a little further through “The Winding Way” a loop of S curves barely wide enough for you to pass through. When we went back up to the surface, my Dad bought me a Caver’s helmet with light and some books on bats and minerals. Then I got a chance to do some panning and I chose to pan for arrowheads. I got about 7 arrowheads from the bag of panning dirt I was given. When we returned home to our cottage we went fishing and I caught my first fish ever. Living in Florida by the ocean, you would think I was a big time fisherman but I guess I like golf, tennis and soccer more. But since I have my first fish I like that too. But my Dad says I have to put the worms on the hook and take the fish off the hook from now on. This is Frederick and I am still thinking about whether I want to fish any more. Did I have a great day (yesterday, Wednesday, the 8th). We drove up to Rome from our cottage on the lake. We were going to go to the old Griffis AFB that had a B-52 SAC bomber squadron and a Buffer on display. My dad says buffer can stand for a number of things but for me it means “big ugly fat fellow”. It was a G model and it was BIG like HUGE. It was the Mohawk Valley and belonged to the 416th Bomb Wing. My Dad’s outfit was the 408th out of K. I. Sawyer. Then we went into Rome central and there was Fort Stanwix which was there when the Revolutionary War broke out. There I had my Dad by me a Dummy Gun which is a wooden replica of a flintlock rifle. We then went into the old fort which withstood a long siege by the British during the war in 1777. The American’s had the Oneida tribe of Indians as their allies but they were slaughtered in an ambush led by the British general St. Leger. The fort was finally rescued from the siege by General Benedict Arnold, of the Continental Army, who would later become a traitor. Next, we headed toward the Rome Sentinel, where someone my Dad blogs with showed us how you make a newspaper. You have reporters and editors on one side and the advertising people on the other side. One is reporting the news and the others are getting the money so they can report the news. Interesting. That is why my Dad buys local so the news can stay local. Then we went downstairs to the rooms where they print the paper. This is a very complicated process and hard for me to explain but the men know what they are doing and put out a newspaper every afternoon. I can tell you it is noisey and you have to wear ear plugs. When the paper comes off the press it is folded automatically and the men every now and then pick up one of the papers and look at the different pages to make sure it good to go. We had lunch in a neat restaurant called “The Savoy”. There were pictures of great Air Force officers and soldiers on the walls. Also, on the walls were pictures of famous people who used to come there to eat. One of them on the wall was Alex Haley who wrote Roots but I don’t know what that is but my Dad says it was best selling book that became a TV series. Hanging all over the dining rooms were pennants from colleges and universities around the United States – pretty neat. After lunch we left to drive back to our cottage and since it was on the way we stopped in Ilion and visited the Remington Arms plant. We were hoping for a tour to watch them make the famous guns they are known for but they don’t do them this year. They did have a small museum which showed the history of Remington firearms and how Mr. Remington used his forge to make the first flintlock musket. 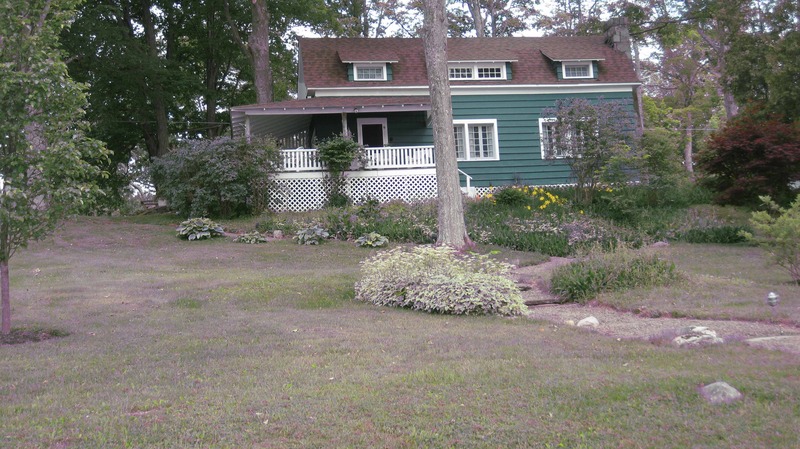 Now we are back in the cottage and last night we had a huge thunderstorm come through and cool off the area. It was 94F in Rome and about 88 here, so that was a good thing. This is Frederick and I am trying to catch up with all that has happened. Next I am going to post about our trip last Tuesday to Howe Caverns. Here is a slide show of photos not previously posted on my blog for the trip so far. I am a little late with this post but we are having too much fun and adventure. On Sunday, we drove down to Cooperstown and went to 11:30 am Mass at St. Mary‘s. It was sort of a strange Mass in that the priest skipped the homily and the sign of peace. But the choir and music were pretty good. After Mass, we went to T. J.’s on Main Street for lunch and then walked up the street to the Hall of Fame Museum for the cricket exhibition. That turned out to be pretty disappointing since we were expecting a game between college teams. What we got was an ad hoc demonstration being held in the HoF‘s sculpture garden. They drove a couple of stumps into the ground and had people trying their hand at bowling and batting. As my Dad said, “that’s not cricket”. After going to the bookstore and picking up “Baseball and Cricket” by Professor George Kirsch of Manhattan University. He was on the roundtable discussion that we atteded the day before. Then we walked back to where we parked the car and saw that there was a baseball game at Doublday Field. I wanted to go and watch, so we sat behind home plate near the score board operator. He showed me how to work the score board. Later we moved over to the first base side so I could chase down a foul ball easier and sure enough one was hit over the seats into the parking lot and I got it. After 6 innings we decided to go back home via Lake Ostego and the Fenimore Museum where we found a famous painting by Ralph Fasanella in the American Folk Art Section. It is called “Night Game – Yankee Stadium”. Mark Fasanella, Ralph’s son, who is a professor of art and architecture at the Southampton campus of Stony Brook University, installed my Dad’s exhibition in the summer of 2008 at the Southampton Historical Museum. It is a neat folk art reflection of American sport especially baseball in the big city. We also saw Edward Hick’s “Peaceable Kingdom”, a version with the poem written along the four borders. Continuing up the Rt. 80 to Rt. 20 we turned toward Richfield Springs and came upon a funky little place called “The Petrified Creatures Museum” that I just had to see. It had a number of wall displays outside of fossils recovered from the mud flats of 500 million years ago when the area was a big inland sea. Now it is an area of shale and slate rock where you can still dig if you want. In the park where plaster cast models of dinosaurs but I have seen better. Finally, back at our cabin, my Mom and Dad and I played a little kick ball and watched the end of the ladies golf tournament and the Memorial. Great day for American Golf with Lincicomme and Stricker winning. This is Frederick and tomorrow we play it by ear. Our First Day on the Lake, Canadaroga That Is! We have been real busy going back and forth to Cooperstown and the Hall of Fame Musem. That and the fact that the WiFi router and DSL which is maintained by the cabin’s owner has been down and finally reset and up again. Friday, we checked in with the owners of our cottage on the lake and went to the local grocery to stock up. We stayed in an had roasted chicken and salad and just hung out looking at the beautiful lake we overlooked from our cottage. 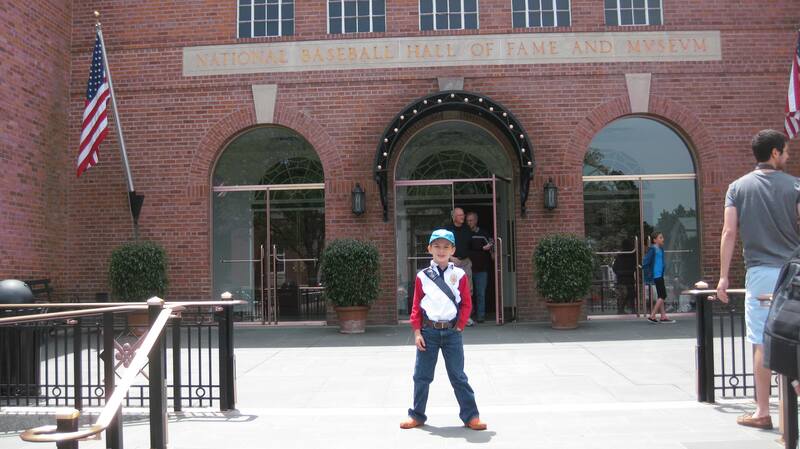 The next day, Saturday, we went into Cooperstown and to the Hall of Fame and the Museum. It was neat. I went to the Swingting Away: Baseball and Cricket Exhibit where my great-great grandfather has his book that he gave Samuel Wright on display. Samuel Wright was the the coach of the St. Georges Cricket Club of New York that my great-great grandfather played for as a professional. His team mate was Samuel’s son, Harry who with his brother George went on to manage and star for the Cincinnati Redstockings, the first professional baseball team. Both Harry, George and my great-great grandfather’s other good friend, Henry Chadwick, are in the Hall of Fame. The book Harry gave Samuel was “Felix on the Bat” by Nicholas Felix (aka Felix Wanostadt, a contemporary of Harry’s father, who was the greatest bowler of his generation as Felix one of the great batters. Since we had already seen this exhibit in London in the summer of 2010 we decided to take in both the Plaque Hall and the One for The Books exhibit of baseball records. 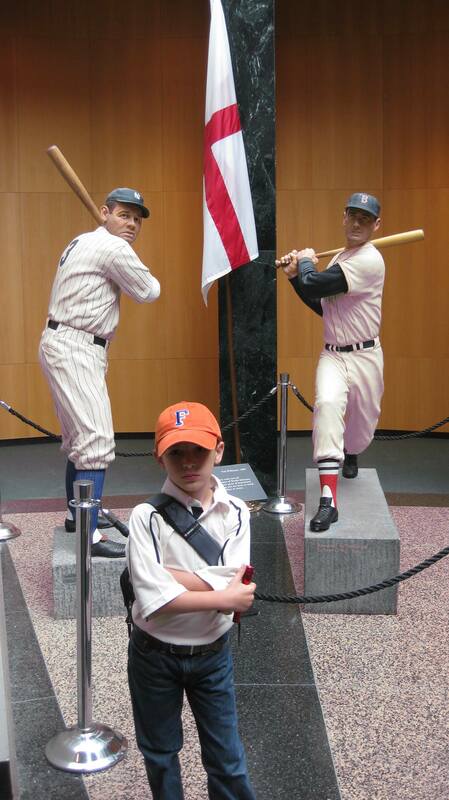 My Dad took pictures of me next to the Pete Rose exhibit. He said it was pretty ironic that the greatest hitter in baseball can’t get into the hall of fame but they take advantage of his performance for one of their exhibits. He said it was like Newsweek taking advantage of Reagan to make him appear Obama’s mirror image. Anyway, it was fun. We had lunch at Tunicliffs which is in a basement and then went back to the museum to do some shopping for my friends. This is Frederick and I am having fun. Leaving the Hall of Fame.